The stripes on this shirt are pretty hard to see, but they are there. It’s a button-up with little grey buttons. It has a left breast pocket that is very hard to see. 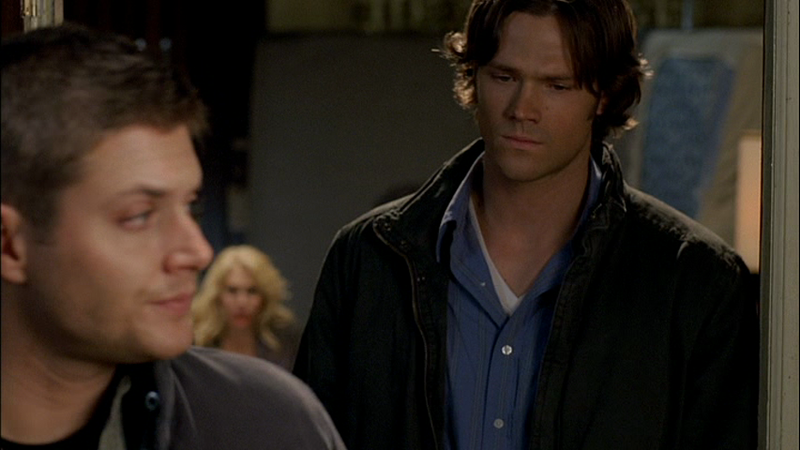 Sam wears it from the beginning of Fresh Blood (3x07), until they decapitate the uninformed new vampire girl. In Ghostfacers (3x13), Sam wears this shirt for the duration of his time in the Morton House. In No Rest for the Wicked (3x16), Sam wears it from when they are getting ready to hunt Lilith until the end of the episode. In The Great Escapist (8x21), Sam is wearing this shirt when he and Dean arrive in Colorado. He wears it until Dean has to put him in an ice bath and the shirt becomes soaking wet. FATE: It gets a bit blood-stained in Ghostfacers (3x13), but only a bit.